Growing up in a military family, Cynthia Sickler of Demonstrative Bears, has spent time living all over the continental U.S.A and even spent a few years in Germany. "I think this is where I developed my love for bears. I was 5 years old and the tiny little town we lived in had an incredible toy shop with the entire Old World feel you can just imagine how exciting that was." 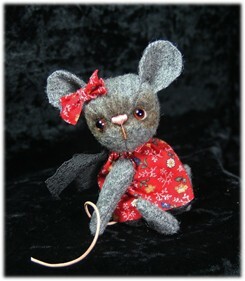 Under the tutelage of her grand-mother, she learned to sew. 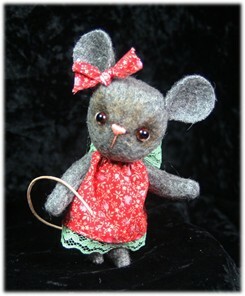 Cynthia was 8 years old and sewing her own Raggedy Anne dolls, learning to knit, crochet and do needlepoint. At 13, she was making Cabbage Patch style dolls from baby photos and she would dress them in infant clothes. She loved creating these dolls and was very excited when she found out that Xavier Roberts, the creator of the Cabbage Patch dolls, was making an appearance at a local store to do a signing of his first mass produced dolls. "Fortunately then, like now, I always carry whatever project I am working on with me, finding time during drives or waiting in lines to stitch a little. Imagine my absolute delight when Xavier actually gave me a little five minute foot sculpting lesson on the doll I had with me!" 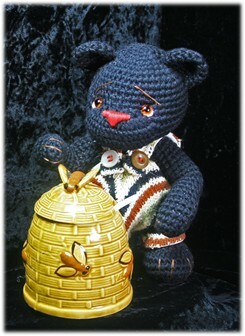 Her inspiration for bear making emerged when she sought employment through a local seamstress who was hiring. "It was an odd interview. She showed me a machine that I had never seen in my life and told me I would be making fur toys for a bear maker in Washington." Cynthia needed work and was game for anything. "So bright and early the next morning, I was learning how to use a 'fur machine.' The machine was tricky and not very much like a regular sewing machine." Cynthia worked there until her eldest daughter was born. After the birth of her daughter, Cynthia quit her sewing job and became a dedicated mother and housewife. Soon with the encouragement of her family and with her prior knowledge of yarn (she worked at a local yarn shop while in high school), Cynthia began designing and making her own crocheted bears. 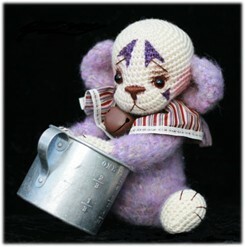 She makes between 40 and 60 bears annually, selling them on her web site, online auctions and the occasional local art show. This passion has continued for the past six years. 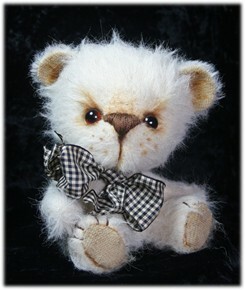 In addition to the bears made from thread, she also makes mohair and alpaca bears. 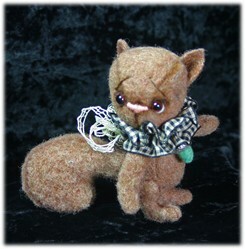 "One of my favorite things to do when making my critters, is to add a penny to the belly filling, for good luck." And good luck is finding its way to Cynthia as she's been working diligently to make enough bears available to fill all the orders for those who are discovering her work through her web site. 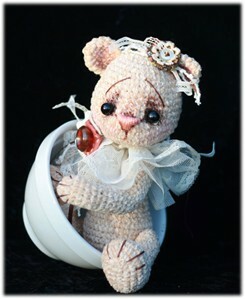 Cynthia also sells patterns so her collectors can make their own crocheted bears. She designs about 25 new patterns annually. Creativeness indulges her imagination and inspire others to find their own little piece of heaven inside this creative industry. A friend introduced her to Amigurumi, which is the Japanese art of knitting or crocheting small stuffed animals and anthropomorphic creatures; Cynthia was immediately enthralled. Now this style of creating has become a self proclaimed obsession for her. 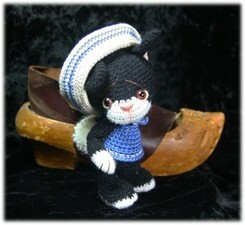 When she's not making bears and Amigurumi creatures, Cynthia enjoys life with her family on their farm in Oregon. The farm is inhabited by dairy goats, chickens, rabbits, cats, dogs, and a very special goose named Gaston. "With the farm, there is little time for anything else, but I do enjoy showing my Pomeranian dogs. We love to take advantage of the wonderful country around us by taking trips to go sledding in the mountains or to drive on Oregon's beautiful Pacific coast." "Our life is enjoyed by spending time with friends, cooking and gardening. And happily, bears and bear related things take up most of my free time."